How to naturally shrink facial pores is often the issue that sought by many women who have oily face because it tends to have bigger skin pores. They don’t only make the skin looks rough, but it also makes makeup application becomes less optimal. Therefore, many methods are used to minimize facial pores, chemically or naturally. However, the use of natural materials lately more preferred because less likely to have side effects. 1. Facial steaming once a week. This method is very effective to help cleaning dirt, grease and removing dead skin cells from your face and nose. 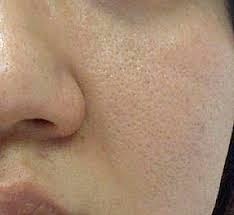 It is also effective to reduce blackheads. It is easy enough to try. Just setting up some sort of a large bowl or container then filled up with hot water. Furthermore, position your face up on the container of hot water at least about 10 minutes. It would be more effective if your head covered with a towel so not a lot of steam coming out. Then wash your face with a scrub; the whole dirt would be easier to clean. Don’t forget to use toners to close the pores. 2. Wiping the skin with ice cubes. Besides being able to shrink the skin pores, the ice cubes will also help facilitating the circulation of blood. As a result, when rubbing ice cubes wrapped in a clean cloth softly to your face, the skin will tend to be reddish. But it’s just a while as your face will be fresh and smooth. 3. Aloe vera. The content of the enzyme in aloe vera will help removing dirt as well as minimizing the pores of the skin. The trick is just simply taking the meat then rubbing aloe vera on the skin. Let it stand for about 10 minutes or until dry. Rinse with cold water and pat dry. 4. Cucumber. Applying cucumber on face can help brighten the skin and provide a cooling sensation on the skin. Cucumbers also help reducing the oil on the face. Cucumbers can be sliced ​​and applied to the face. Leave it for 10 minutes then rinse and dry. 5. Baking soda. The use of baking soda as a facial mask will help making your face looks clean in addition to the facial pores are also smaller. Just need to take baking soda adequately, then add a little water until thickened and then wipe it evenly on the face and let it stand about 15 minutes, rinse with water and dry. 6. Vinegar. Mixing vinegar with water and then using a cotton swab, applied it to the face and allowed to stand for 10 minutes, rinse cleanly. The solution may help cleaning up the pores of the skin also reducing the levels of facial oil. 7. White eggs. Another method is to rub the white part of the egg to the face. Allow it to dry and then rinse and dry. Which one you choose? It looks simple, isn’t it? But guys, keep in mind that the tips to shrink facial pores are only effective when you do the facial treatment on a regular basis.